Editor's Note: The Omar al-Bashir government that governed Sudan for 30 years was brought to an end Thursday. Gao Yang, a Khartoum-based reporter for the Global Times who experienced the coup, believes that the incident, coming soon after the resignation of the long-term Algerian president, was a coincidence, but one that was bound to happen. Sudan's current situation was caused by a combination of economic problems and a corrupt political system, but a change of government may not solve its problems. The new administration and the public will have to face up to a worsening economic situation. On April 11, 2019, after nearly five months of continuous protests and demonstrations, a military coup took place in Sudan. The military announced that it had arrested President Omar al-Bashir and relieved him of all his duties. It established a transitional military council to exercise state power during a two-year transition period to prepare for elections of a new civilian government. At this point, Bashir's rule collapsed after having been in power for nearly three decades. A military coup in Sudan was in the end inevitable. It coincided with the resignation of the former President Abdelaziz Bouteflika of Algeria on April 2 under pressure from the people and the military, which gave great encouragement to the Sudanese opposition and protesters. 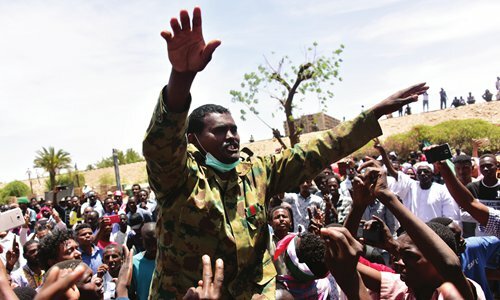 As April 6 marked the 34th anniversary of the overthrow of the former president Jaafar Nimeiri in a bloodless coup, the opposition and protesters succeeded in winning support from lower and mid-ranking Sudanese officers, resulting in a division of the Sudanese army on the Bashir side. This forced the Sudanese military to launch a coup and overthrow the Bashir regime. What actually led to Bashir's fall from power was the disappointment and distrust from the Sudanese public toward the government, along with an accumulation of economic problems and corruption, leading to immense pressure of people's lives. Sudan has abundant water resources and is suitable for agriculture, although much fertile land lies uncultivated. It leaves a lot of Sudanese in the cities with nothing to do but drink coffee and chat with their friends all day. The independence of South Sudan in 2011 dealt a heavy blow to Sudan's economy. When South Sudan was still a part of it, Sudan used to be relatively wealthy due to its rich oil resources. The former Sudan government adopted a similar welfare system as in many other resource-rich countries. It provided huge subsidies for daily necessities, such as food, sugar, and gas. There was universal welfare, which allowed people to enjoy their lives at a very low cost. The Sudanese gradually became accustomed to a high welfare standard, so they could have a pretty relaxing lifestyle in big cities, such as Khartoum, without working hard or putting in too much effort. The good old days suddenly ended after the independence of South Sudan, which took away almost three-quarters of Sudan's oil-rich lands. The economy began to deteriorate as the country's economic lifeline the oil industry was on the edge of collapsing and foreign exchange reserves were in short supply. The Bashir government was unable to make ends meet, since the vast majority of fiscal revenues obtained from agriculture and taxes were not able to fill the bottomless pit of the huge subsidies given out for high-value necessities. The authorities then had to reduce the subsidies and raise prices, which irritated many Sudanese who were used to the welfare system. This is what led to the protests which precipitated the coup. The declining economy since 2018 caused serious inflation in Sudan. The price of goods skyrocketed except for government-subsidized necessities. There was not enough currency being circulated in society. People could not withdraw enough cash from the banks, so they began to distrust the whole banking system. Many Sudanese stopped saving money in banks, which only worsened the situation. Due to serious insufficiency of cash, banks had to limit the maximum amount that people could withdraw each day, leading to long lines of people at ATMs. Corruption was so pervasive in Sudan that Sudanese are accustomed to it. In Sudan, people can easily pass their driving test or avoid traffic fines by offering "tips." The fundamental problem of the country is its economy, and after a brief celebration, Sudanese people and the new government should understand that basic problems will not be solved by only changing a leader or a government. After gaining political power, the new government and its leaders need to face the challenge of improving people's livelihoods. Chinese people living in Sudan are familiar with the Arabic word "sadiq," which means friend in English. Sudanese locals, whether upper class or ordinary people, will say "Hey sadiq" when they first meet a Chinese, and this is based on the 60-years friendship between China and Sudan. Since the two countries established diplomatic ties in 1959, China's assistance to the North African country has never ceased. China built pipelines and refineries to help Sudan develop its oil fields and establish the mainstay of Sudan's national economy. In the field of agriculture, China provides financial and technological support to Sudan which greatly increased grain output and solved the problem of food shortages and poverty. China also built multiple hydropower projects for Sudan which solved the problems of electricity and water shortages. Pictures of these projects are printed on the country's bank notes. The standard of living of Sudanese people has been largely improved due to assistance from China. Additionally, since 1971, China has sent 34 groups of medical teams to not only provide professional medical treatment to locals, but also help train Sudanese doctors. Chinese UN Peacekeepers have been deployed in the Darfur region of Sudan since the military conflicts of the 2000s, and these Chinese UN Peacekeeping Forces play a key role to safeguard regional peace and prevent further ethnic conflicts. On the current situation of Sudan, Chinese Foreign Ministry spokesperson Lu Kang said at a daily press conference on Friday that "we believe that the Sudanese side is capable of managing its own internal affairs and ensuring its national peace and stability." "No matter how the situation may evolve in Sudan, we will remain committed to upholding and developing friendly and cooperative ties," he said.